Slavoj Zizek, a contemporary philosopher and cultural critic, says that happiness is a very conformist category. "You have a serious ideological deviation at the very beginning of a famous proclamation of independence - you know, pursuit of happiness. If there is a point in psychoanalysis, it is that people do not really want or desire happiness, and I think it's good that it is like that. "1 When I first heard these words, I immediately related them to my education. Do I really want to get what I think I want? It's a philosophical question that presents the reality of a college student: we pursue something we think would make us happy, but most of us develop into uninteresting individuals, ready to get traditional jobs and go with the flow. In my opinion, college is slowly killing my creativity and I will choose to get out of this vicious circle that's keeping me in the dark spot between my ideals and the reality. 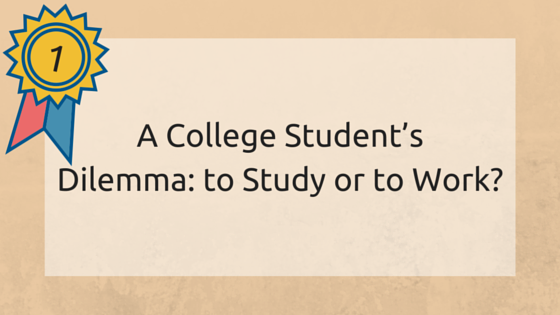 The answer to the student's dilemma is obvious: work. Since I was a little boy, I was always anticipating education as something I was obliged to. However, as I was quickly becoming a part of the traditional schooling system, I started perceiving the classroom as something monstrous. Teachers didn't tell me anything about the things I wanted to know. I was interested in the Universe ever since I was little. They made me memorize historical data, math formulas, chemistry lessons and other details I did not want to know. The excuse is that we need versatile education that would help us discover our true interests, but the truth is that most of that information evaporates right after taking the tests. By the end of high school, I was already 'customized'. I was ready to fit into the system and proceed to college. Was I prepared to follow my dreams and study astronomy? Of course not! I did not have the needed base of knowledge because I had to learn other things for the sake of grades and I never had time to explore my interests outside school. My college professors think I'm not interested in education. They are wrong; I am interested in knowledge. However, I want to gain knowledge that will prepare me to face real challenges. I do not want to attend numbing lectures and study materials I will never use. It seems that the more 'knowledge' I gain in the lecture halls, the less I know about my life and my purpose. Higher education may have worked some time ago, but today it is more ineffective than ever. The main problem of college curriculums is their failure to prepare students for the future in front of them. The reason for that is quantity. Every high-school graduate is pushed towards college as the only way of pursuing dreams. Parents want to be proud of their children, and it seems that a high school diploma is not enough to make them happy. My parents would be thrilled if I got my college degree and spent the next decade in repaying loans. After two years spent in attempts to make them happy, I decided to crush their dream and follow my own. The failure to finish college doesn't make people uneducated. The greatest tragedies in human history were not caused by uneducated people. In fact, wars have been a direct consequence of the intelligence of people with degrees. People's attention is focused on fitting into society and common expectations. I find it impossible to reshape myself to fit into the cavity my parents have crafted for me. Instead, I will start shaping my own life in accordance with the capacity I possess. Dreams can change. Only few of us grow up into the individuals they imagined they would be, simply because society imposes different standards. However, I decided to go back to my original interests and start exploring the Universe as I always wanted to. The Universe decided to collaborate: I got a job in a telescope store and I'm finally confident in the decisions I make. Zizek is wrong. People do need to be happy. Happiness is the least conformist category; it's individual and necessary. Education should support the mission of becoming happy; it shouldn't drive us away from it. We are constantly being exposed to an explosion of information. Colleges play with the trends: since more knowledge is available, they want us to study more. However, the quantity of information we burden our minds with does not make us wise or interesting. It only makes us ready to participate in a TV quiz show. Our modern and developed society is nothing more than a setting that produces 'educated' people that don't know many useful things. Labeling people according to the education they have obtained is the worst form of cultural arrogance. Some college students find their calling in becoming respectable academics. Others are lost with a degree that doesn't get them a job, so they have to work anything just to cover the debt. I choose neither of these options; I decided to be free and start doing something I was meant for. Now, I am free to learn the things I want to know, and I know I won't regret this decision.